Discussion in 'Online Games - News and Reviews' started by Marina, Nov 11, 2013. Microgaming has released a high adrenaline, fast past 243 payline video slot that will even have the non-racer excited. This fast past online video slot will have racers competing for the ultimate prize. Racing for Pinks is not your average track racing. This is street racing at it's finest. 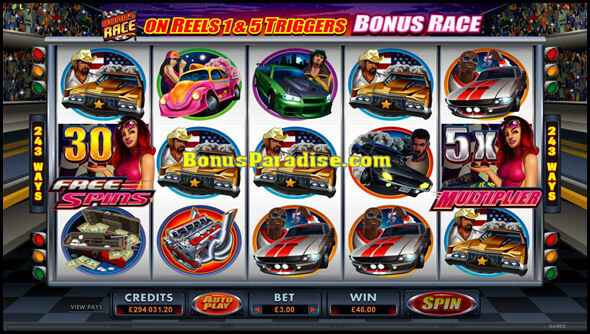 The high octane cars are turbocharged and Microgaming has made that pretty clear with the superb graphics and sounds. You'll feel as if you were in the drivers seat. Get ready to drive to some winnings. Race into free spins and a bonus round to grab some great cash. Racing for Pinks is a 243 ways video slot that has 5 reels and 3 lines. Winning combinations start with at least 3 same symbols on any line. There is a minimum fixed bet. Players can choose the number of coins per bet to increase the amount of their winnings. You may choose the autoplay function at anytime. Although there is no Progressive Jackpot to be won, the Bonus Round or Free Spin feature could have you earning some incredible winnings. All wins pay left to right except the Girl Scatter which appear on reels 1 and 5. Also, the Bonus Game Symbol only appears on reels 1 and 5. Racing for Pink Wild symbol substitutes for all symbols except the Scatter and bonus symbol. Winning symbols include, Fiery Hot Rod, White Car, Gold Car, Black Car, Green Car, Pink Car, Nitro Boost, Engine and cache of Cash. As a street racer, you hope to get the Bonus Round. The Bonus Round occurs when the Bonus Race symbol appears on reels 1 and 5. You can win up to 175x your bet. You race around the payout board. If you choose correctly, you'll advance to the next level and will continue. There are 5 levels to win. Pick the best racer and advance to some incredible winnings. The free spin feature is triggered when you land the Pink Lady Scatter symbol on reels 1 and 5. You will be rewarded with up to 30 free spins. During the feature, should you land a Scatter on reel 5, your multiplier increases up to 5. Receive 2 Pink Lady Scatters and your winnings are 2x's your bet. You can also go into the Bonus round should the Bonus symbol appear on reels 1 and 5. The feature can not be re-triggered, but with the multiplier you could earn some serious cash. Racing for Pinks is a highly motivated, integrated online video slot that will have you as the player racing for winnings. Try it today at Golden Tiger Casino. That checkered flag is in your reach.